When it comes to smart home devices, protecting the safety and security of your home when you aren’t there is a popular area of adoption. Traditional home security systems are either completely offline (an alarm sounds in the house, but nobody is notified) or professionally monitored (with costly subscription services). 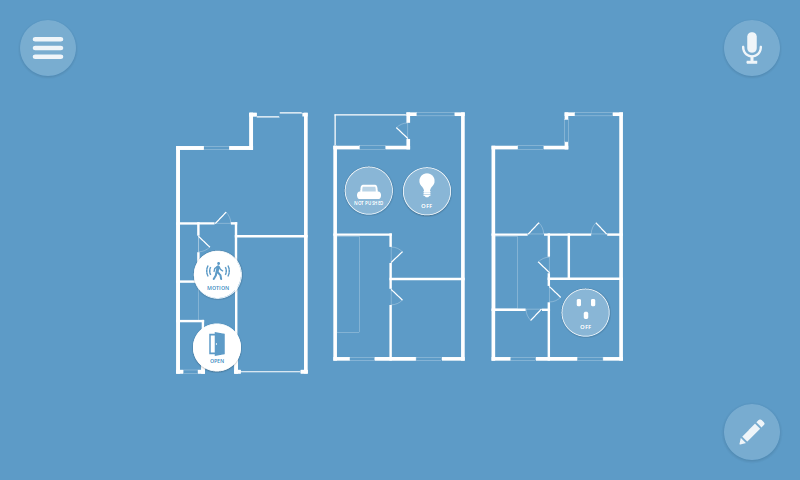 Self monitoring of your connected home therefore makes sense, but many current smart home solutions still require ongoing service fees and send your private data to a centralised cloud service. The latest version of the Things Gateway rolls out today with new home monitoring features that let you directly monitor your home over the web, without a middleman. That means no monthly fees, your private data stays in your home by default, and you can choose from a variety of sensors from different brands. 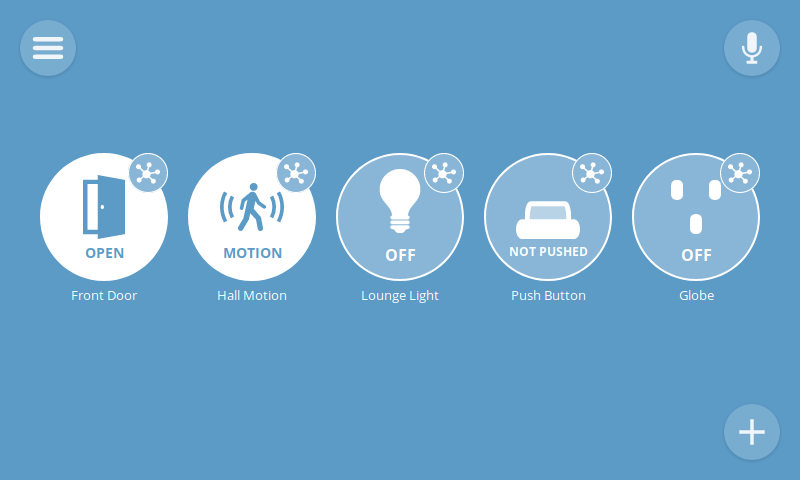 Version 0.6 adds support for door sensors, motion sensors and customisable push notifications. Other enhancements include support for push buttons and a wider range of Apple HomeKit devices, as well as general robustness improvements and better error reporting. The latest update comes with support for door/window sensors and motion sensors, including the SmartThings Motion Sensor and SmartThings Multipurpose Sensor. These sensors make great triggers for a home monitoring system and also report temperature, battery level and tamper detection. You can now create rules which trigger a push notification to your desktop, laptop, tablet or smartphone. 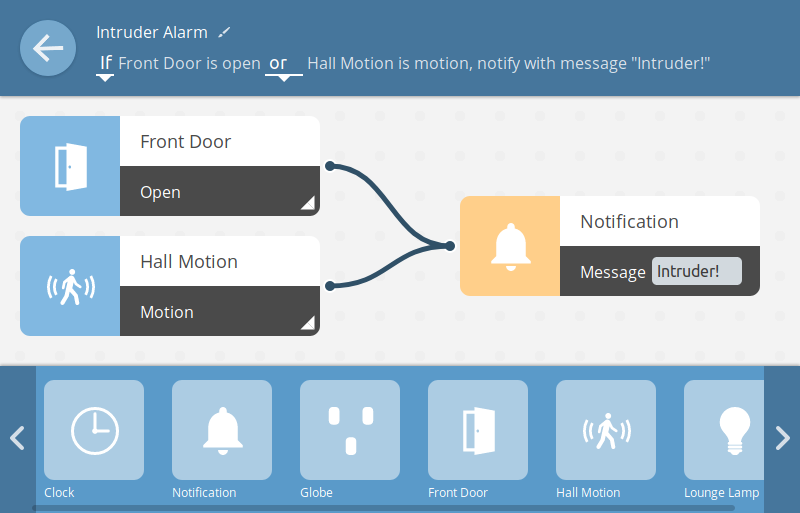 An example use case for this is to notify you when a door has been opened or motion is detected in your home, but you can use notifications for whatever you like! To create a rule which triggers a push notification, simply drag and drop the notification output and customize it with your own message. Thanks to the power of Progressive Web Apps, if you’ve installed the gateway’s web app on your smartphone or tablet you’ll receive notifications even if the web app is closed. 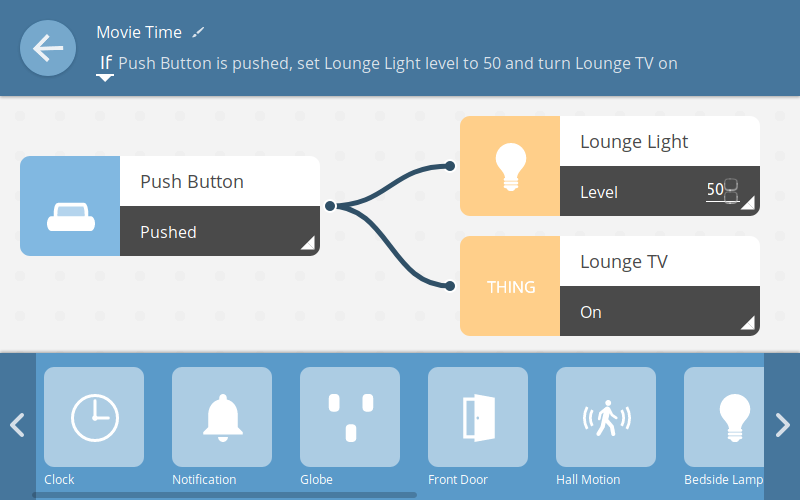 We’ve also added support for push buttons, like the SmartThings Button, which you can program to trigger any action you like using the rules engine. 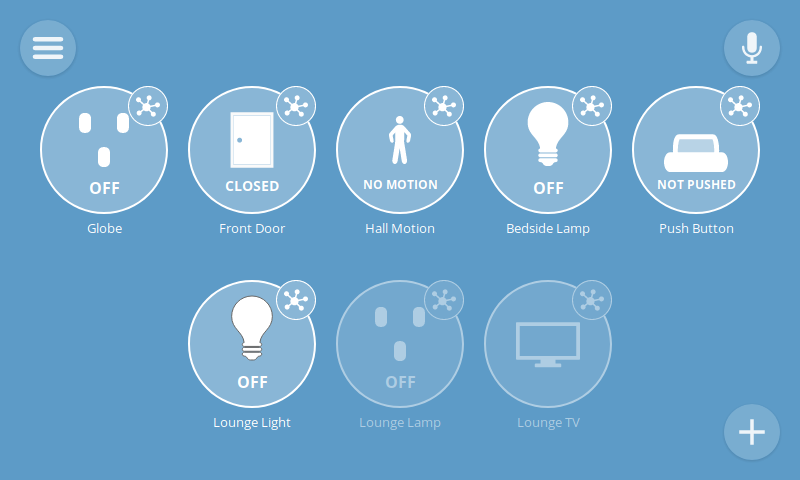 Use a button to simply turn a light on, or set a whole scene with multiple outputs. 0.6 also comes with a range of robustness improvements including connection detection and error reporting. That means it will be easier to tell whether you have lost connectivity to the gateway, or one of your devices has dropped offline, and if something goes wrong with an add-on, you’ll be informed about it inside the gateway UI. If a device has dropped offline, its icon is displayed as translucent until it comes back online. If your web app loses connectivity with the gateway, you’ll see a message appear at the bottom of the screen. These devices use the built-in Bluetooth or WiFi support of your Raspberry Pi-based gateway, so you don’t even need a USB dongle. You can download version 0.6 today from the website. If you’ve already built your own Things Gateway with a Raspberry Pi and have it connected to the Internet, it should automatically update itself soon. We can’t wait to see what creative things you do with all these new features. Be sure to let us know on Discourse and Twitter! Full time UK-based Mozillian, working on the Web of Things. I can see Mozilla IoT growing up rapidly in many aspects. For example, giving support to first line manufacturer products …but, I think there aren’t any news about maker-friendly hardware like ESP8266-ESP32, Arduino. We are so much people that will appreciate some improvements (libraries, example code, tutorials) about integrating solutions based in such inexpensive hardware. We are continuing to evolve the Things Framework to support new features of the Web Thing API, including the webthing-arduino library, and there’s some guidance on our blog. If there’s something specific you’d like to see then let us know. I have 0.6 set up now and I’d like to add some stuff to test with. Are there any cheap things we can test with? If you’re looking for a smart bulb then I’ve found IKEA TRADFRI bulbs are quite affordable, but take a look at the list and see what you like the look of. Can you also tell what can be done with a Chromecast? There’s an experimental add-on contributed by a community member which lets you pause/play playback, see the name of the current app, and “stop” to go back to the Chromecast home screen. Connectivity is currently a bit unreliable but it does work. Just to be sure, the hub for the Ikea bulb is not necessary? Correct, you can pair IKEA bulbs directly with the Things Gateway, if you have an XStick Zigbee dongle. Does that do the trick too? Sorry by currently only the XStick is supported, but Dave Hylands is working on adding support for more Zigbee dongles, including ConBee (see here https://github.com/mozilla-iot/gateway/issues/410#issuecomment-431885030). You’ll also find an extended webthing-arduino library that supports labels, units and writable property (when it is implemented) on the same page. Hope that helps and there is much more to come! I see there is no mention of Alexa or Google Home integration (unless I missed it?) Any plans for that support? Hey, i was wondering if there was a guide on setting up the gateway to send push notifications and installing it as an app on your phone. If yes then could you please share the link here. Hi Rahul, we’re working on a user guide at the moment. In the meantime you can create rules in the rules engine with a notification as an output and provide your own notification message. You can add the Things Gateway web app to your home screen in Firefox for Android by pressing the add to home button in the URL bar (see here https://hacks.mozilla.org/2017/10/progressive-web-apps-firefox-android/).